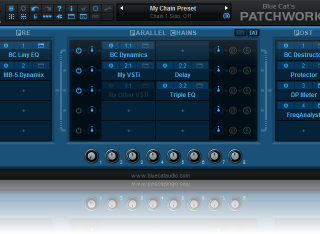 You will find here some custom presets to use with the Blue Cat's PatchWork product. To use a preset bank, download the file, unzip it and then select the unzipped preset in your plug-in user interface (check this tutorial or your user manual for more information). Description: Guitar presets collection including legendary guitar tones reproduced with Blue Cat's Destructor, Late Replies (VST), and built-in plug-ins. Demo videos: Brian's Rhapshody / NEWS / EVH Eruption / EVH Mean Street / Whole Lotta Lead / Whole Lotta Rhythm. Note: The "NEWS" preset also requires the Dynamics VST plug-in. If you have some presets you want to share with the community, please contact us: export your presets using the plugin export function, and send them to us together with a description, a title and your name. Once validated, the presets will be published on this website. For more information about how to export the presets in the appropriate format, please check this Presets Export tutorial.